Michigan may be one of the nation’s cloudiest states. This hasn’t deterred SolarYpsi, a grass-roots effort, from making Ypsilanti, Michigan into a “solar destination”. Dave Strenski and his counterparts started have been at it for about a decade. Their first project was a four-panel installation on their local food co-op. Their all-volunteer effort continues because of a civically-engaged community. This project was the start of something much bigger. Their goal is to make their town of 20,000 people a hub of solar energy. The idea is to have solar installed on 1,000 area rooftops within one square mile. Once folks heard about this project, they started sending in more ideas for projects and grant opportunities as well. Now, Ypsilanti is home to more than five-dozen solar projects. The group has worked closely with the community. Eastern Michigan University is located in the town. 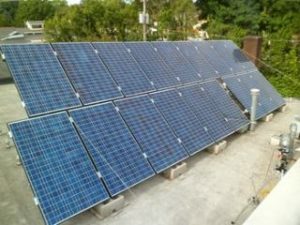 SolarYpsi has used that connection, and the help of an EMU programming student, to develop an in-depth website that explains how solar technology works. They also use the site to show off their projects. Their site offers detailed technical specifications and permitting instructions. The idea is that someone could come to the website and learn how they could put solar on their own home. The site also collects system performance data from many of the installations. Strenski says this is especially useful for students who can experiment by comparing systems to see which have the best output. One day, they got a call from Google. The company had heard about their work and wanted to feature them in a commercial. It reached out to Dave, who spent months over a series of emails and phone calls and emails to explain how the group works. In the end Dave said, they “won them over”. This helped their group receive national exposure. Solar Ypsilanti continues to develop interesting ways to promote their work. Each project Solar Ypsilanti helps gets a special plaque. The plaque includes a QR tag that visitors can scan. The tag sends the visitor to the site’s web page where they can learn more about it. A neighbor of Strenski’s has a drone helicopter. He attached a camera to it and has created short videos profiling many of their projects. This is especially beneficial for projects that are on flat roofs and hard to see from the street.